Earlier this month, Dutch Minister of Education Jet Bussemaker announced plans to protect the degrees and titles of Dutch Higher Education in a proposed change the Act of Higher Education. Wittenborg supports the general regulation, however has now reacted strongly against one of the suggestions included in the proposal that limit the use of the singular term ''University". Bussemaker is suggesting that Universities of Applied Sciences cannot describe themselves as a University, and that if they do refer to themselves as a University rather than a University of Applied Sciences they risk a very hefty fine! According to Wittenborg's British Chair of the Board, Peter Birdsall "This notion of a Dutch Minister trying to regulate the English language like this is complete madness. If you are a University of Applied Sciences, you are a University, just like if you are a bird of prey you are still just a bird"
This week, Wittenborg University has sent a letter to the Minister, expressing its serious concerns and clearly stating that it will not refrain from using the term "University" as a singular description. "If the Netherlands wants to clearly promote its binary higher education system, then it can easily do so through the strict accreditation processes and mechanisms currently in place, as well as internationally through Code of Conduct for International Students in the Netherlands" Birdsall adds. 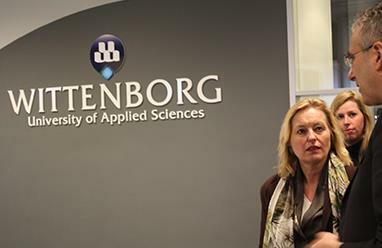 (Picture) Minister Bussemaker visited Wittenborg University in March 2014.